Mercedes launching B-Class Electric Drive in 2014, starting in the U.S. 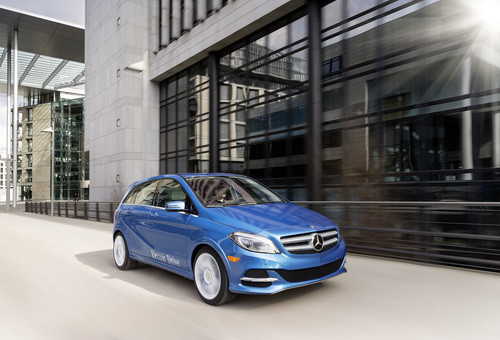 The Mercedes B-Class Electric Drive features a drive train designed by Tesla Motors, luxury features you'd expect from Mercedes, and is due to go on sale in early 2014. Mercedes-Benz is introducing its' first luxury all electric car, the B-Class Electric Drive, at the New York Auto Show this week. The car will launch first in the U.S. for the 2014 model year, and Daimler promises it "combines dynamism and driving pleasure with zero local emissions – in short, electric driving at the premium level". You wouldn't know this from Daimler's press release, but the B-Class Electric Drive sports a drive train and battery pack system supplied by Tesla Motors. The 2014 B-Class Electric Drive will be based on the conventionally powered B-Class. In the U.S. the B-class Mercedes will be available exclusively as an electric car. The car is a five-seater and retains ample cargo capacity for two reasons. First, the rear cargo area has a high roofline, and second the battery pack is underneath the passenger cabin rather than consuming space in that area. It is a Mercedes, meaning that this car is built with the high-quality materials, finely structured surfaces, premium details, and precise finishing that you would expect from a Mercedes. The dashboard has a series of three circular air vents with sporty nozzles that contribute to the emotional design of the interior. Above these vents is the information display system offering levels of convenience and functionality that were previously reserved for higher classes of vehicles. Standard features include the Audio 20 with a 14.7 cm color screen, a twin tuner, an MP3-capable CD player and a USB connection. Navigation is provided for by the Becker MAP PILOT. The multimedia system with internet access, navigation and voice control is also available as an optional extra. This display also shows electric drive specific information, such as power level, estimated remaining range, and the amount of energy being recovered from regenerative braking. The car offers remote connectivity over the Internet using either a smart phone app, or PC based access. It offers remote checking of vehicle status and configuring certain vehicle parameters. The planned route can be displayed along with available charging stations along the route. The B-Class Electric Drive also comes with a radar-based collision warning system COLLISION PREVENTION ASSIST with adaptive Brake Assist. The system gives the driver a visual and acoustic warning of recognized obstacles, prepares him for braking action and assists him with the braking process as the situation requires. Other driver assist features include Blind Spot Assist, Lane Keeping Assist and Active Parking Assist. The electric drive train is rated for over 100 kilowatts (133 horsepower) and over 310 Nm of torque. Range is estimated at 115 miles (US City) but this is not an official EPA range certification. Charging time, for a range of 60 miles, is rated at under 2 hours with a 240 volt 40 amp connection. What this translates to is that some J1772 charging stations will be capable of supporting a 40 amp charging rate, and at those stations the time for a full recharge is 2 hours. Many of the public charging stations are rated for 30 amps (or so) making the time for a full recharge closer to 3 hours. The other detail with that charging time, is that the 2 hours is not for a full recharge, but for a range of 60 miles. The full recharge time would be approximately double this amount of time. Performance is a relatively mild 0-60 miles/hr time of 10 seconds, and top speed is electronically limited to 100 miles/hr. Mercedes says this is configured to preference total driving range. Mercedes has not given pricing information, but has said it will be launched in the U.S. at the beginning of 2014, and subsequently in Europe. Daimler is an investor in Tesla Motors, and in exchange Tesla has "provided development services and powertrain components to Daimler AG (Daimler) for its Smart fortwo, A-Class, and B-Class electric vehicles." According to Tesla's 2012 10-K filing, the company received a purchase order in February 2012 for development of the full electric drive train. The two companies have worked together on other electric vehicles including the smart fortwo Electric Drive, and the A-Class Electric Drive. As of December 31, 2012, the companies were still negotiating an agreement for production parts for the B-Class Electric Drive. According to Dr. Joachim Schmidt, member of the Mercedes-Benz Cars Board of Management responsible for Sales and Marketing: "The B-Class Electric Drive meets the wishes of many customers for emission-free driving without foregoing the hallmark attributes of a Mercedes-Benz, namely safety, comfort and, of course, not to forget exhilarating driving pleasure."